It’s always fun to start thinking about gardening this time of year: our energy returns as we think of new beginnings and yet another season of growth. By the time March rolls around, it will be time to start thinking about planting. And that isn’t too far away! So here are some tips for growing strong, successful seedlings that will thrive in the right conditions. Seedlings need adequate space to grow roots. They will spend a minimum of 3 – 4 weeks in that wee space, sometimes more, so this will determine the container you use. No matter the size, however, containers need to have a depth of at least 2” – 3”, and must have drainage holes. Veggie transplants that will require containers larger than a 1020 flat of 72 cells include: cucumbers, melons, tomatoes, corn, eggplant, peppers, and squash. The proper growing medium can determine whether or not your seedlings survive beyond germination. There are a number of recipes out there, but a very common question is whether or not to use garden soil in your seed starting mix. I know a number of growers that do, and haven’t had problems—one recipe consists of leaf mold, garden soil, and green sand. But if you really don’t want to lose any seedlings to damping off it’s advised you use a sterile mix. You can sterilize garden soil if you want, but it’s laborious. This requires heating it to a certain temperature, for a certain amount of time. Otherwise, common sterile seed starting ingredients include peat moss, vermiculite, perlite, sand, and coir. Perlite and vermiculite are different substances, but have similar characteristics—similar being moisture retention and sterility, and different being drainage ability and nutrient-holding capacity. 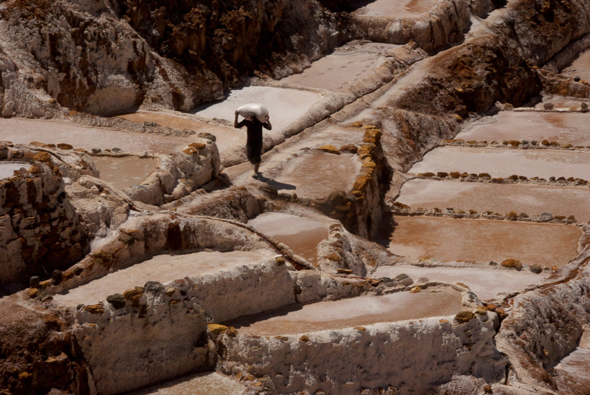 Perlite is made from super-heated volcanic glass, and is the one that looks like Styrofoam. The small holes created by the resulting expansion trap and hold moisture, and the light pellets prevent the rest of the mix from compacting. Vermiculite is super-heated mica. It still traps and holds moisture and air, but does not drain as much as perlite, and holds nutrients better. It also has a lower pH than perlite. It won’t make a huge difference to most vegetable seedlings, but if you’re planting pH-sensitive varieties, or heavy feeders that will stay in a pot for more than a few weeks, like tomatoes, this will make a difference. Cuttings will prefer quick-draining perlite. The coir I’ve trialed stunts seedling growth 2 – 3 weeks after germination, so I don’t use it. This may be due simply to the variety of coir I used, as they all vary in salinity, acidity, and macronutrient levels, so it may be worth trying with some of your seedlings. It would be mixed with other ingredients, just as you would peat. This is most important in the beginning of the season because outdoor temps will affect when you plant your seedlings. If they are planted indoors too soon, and cannot go outside because soil temps are not yet high enough, they will be in their seed container too long unless they can be potted up. If temperatures are increasing, subtract days from your planting date to account for the increasing growth rate. I would argue this is the most crucial step to seed germination. The required temperature you find on each seed packet is for soil temp, so investing in a small soil thermometer is advised. Each seed type has an ideal range, but somewhere between 18 – 25 degrees C will cover most. If it’s any colder than 10 degrees C, they will take longer, or not germinate at all. Heat mats, coils, or tubing help immensely in this regard. Once planted and moistened with a light watering tool, cover to retain heat but check regularly for germination and uncover promptly for light. If you don’t they will get leggy really quickly. After germination, most seedlings like a temperature range between 20 and 21 degrees C, but 18 – 20 degrees C is usually fine. Heat lovers, such as tomatoes, will need more. Most seeds can germinate with or without light—this is why, after you plant and moisten, you can use another black 1020 tray to cover until germination. Some seeds, however, especially small annuals like lettuce, require light to germinate. Most seedlings need around 8 – 12 hours of light per day, after germination. If you’re using fluorescent lights, they need to be placed no more than 3” above plants to prevent legginess. Germination requires consistent, but not heavy, surface moisture. It is worth it to invest in a good pump sprayer as they water the surface lightly and evenly and do not displace seeds. It is best to water from above until your seedlings have adequately germinated and roots are established. Then you water from below to prevent the mix from getting to soggy. Once they have established, letting the mix dry out a bit between waterings prevents molds and fungus if you’re using soil, and is better than over-watering: in most cases, you can save a dried out seedling before you can save an over-watered one. Water softener is also not good for seedlings, so use an alternative if you can. Most seedlings prefer a humidity level between 50 – 70%, so it’s useful to have a thermometer that also has a humidity gauge. If levels get too high, use an upright fan, or – if it’s really humid – a dehumidifier. But an upright fan for garden seedlings is most often enough in our climate. Air space within the seed starting mix is also very important, so make sure your recipe has adequate ratios. When it is time to transplant your seedlings, stems and roots are easier to separate when the soil is dry, but if you’re transplanting plugs, I prefer them to be moistened. They should be transplanted at the same depth or a little deeper, but do not bury the stem too much in the soil, other than for tomato plants. Water them well, fertilize, and let them rest. It is best to transplant on overcast days with no wind because little seedlings get stressed out when they’re transplanted, and too much heat makes this experience worse. Hardening off will mitigate transplant shock. Do this about three days prior: set them outside for a few hours in the day, and bring in at night. If it’s really hot, lessen their exposure to an hour. Seeds are amazing little things: they contain enough nutrients to keep the plant going for the first two weeks of its life, or until the first set of true leaves appear. After this, they need to be fed, but only a little bit. Feed them a half dose of fertilizer – I like to use a liquid kelp – until they are 3 – 4 weeks old. After this, fertilize once per week at full strength if they are not yet transplanted into the garden. They are the most common factors in germination success. Ensure the temps are in the proper range, surface is kept consistently moist, (if it dries before a seedling has established, this will kill any emerging roots), and that the seed is viable: check the shelf life of your seeds. 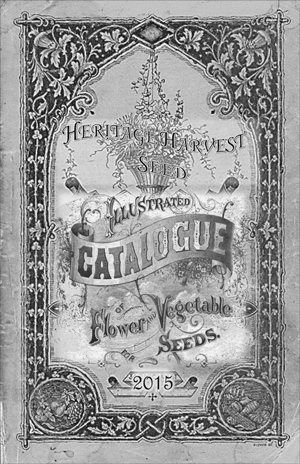 Most seed packets include recommended planting depths, but the reason I haven’t included them here is because I have found it often doesn’t really matter, unless there is a huge difference (for instance, if you plant a lettuce seed 2” into the mix, instead of just pressed into the surface). In addition to my own experience, most farming and gardening books focus more on spacing, and don’t even mention depth, because it is way more important to your overall yield. General rule of thumb: plant as deep as the seed’s diameter. Brianna is a certified organic gardener from Victoria, BC, living in Williams Lake. She operates Puddle Produce Urban Farms, growing vegetables in city backyards and lots. 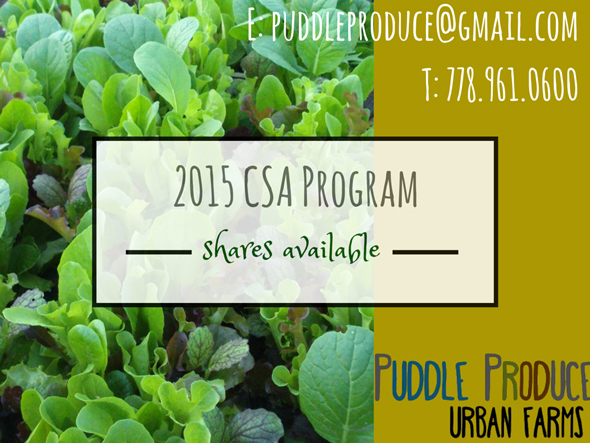 If you’re interested in the 2015 box-a-week program, email her at puddleproduce@gmail.com or call (778) 961-0600.